The Mpumalanga region of South Africa is home to approximately 4.42 million people  and, as many other regions in Africa, has faced terrible and worsening droughts for over a century. In terms of human experience, the 2016-2017 drought was the worst on record. With drought comes other problems with long-term consequences: poor education due to school closures and a lack of employability skills, which can have major negative impacts on individuals’ resilience in the future and means that young people are often unable to get involved in shaping future water and infrastructure policy. We saw that research was needed to both confront the intractable challenge of drought and ensure that young people stand the best chance of having meaningful input on an issue that will affect their future. With colleagues from 3 universities in South Africa led by Professor Linda Theron at the University of Pretoria, 2 UK universities and 2 community organisations in South Africa and the UK, we initiated a research project called Patterns of resilience among young people in a community affected by drought: Historical and contextual perspectives (Patterns), funded by the Global Challenges Research Fund (GCRF). With such a wide-ranging scope, our project required a multi-disciplinary team from the outset. We assembled a team that included university students, young people with lived experience of drought and other adversities, and researchers in Educational Psychology, Sociology, Health Policy, Arts Activism and Climate Science. In April 2017, our research began to uncover what factors help young people to stay resilient in the face of drought and what could be done to improve existing policy and infrastructure around drought. 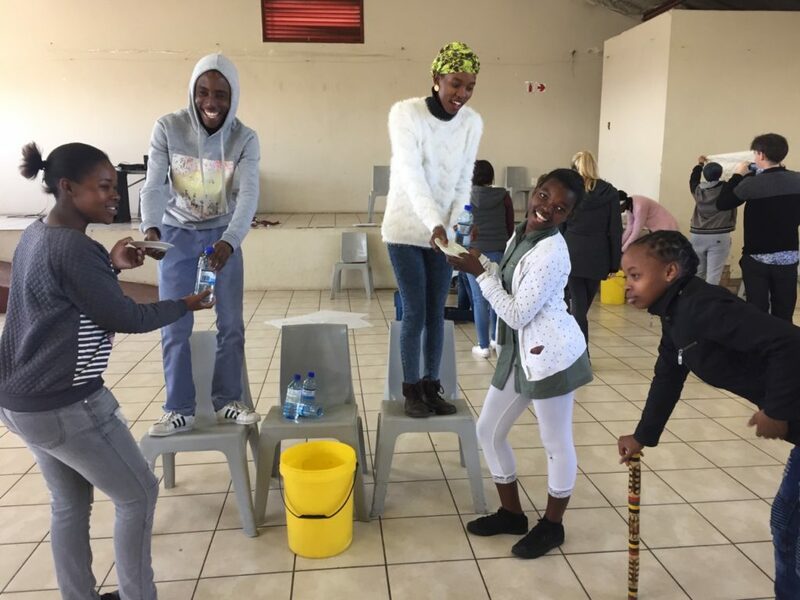 A community partner organisation, Khulisa Social Solutions, recruited fifty Leandran young co-researchers to take part in research activities, such as body mapping the physical, emotional and mental consequences of drought. 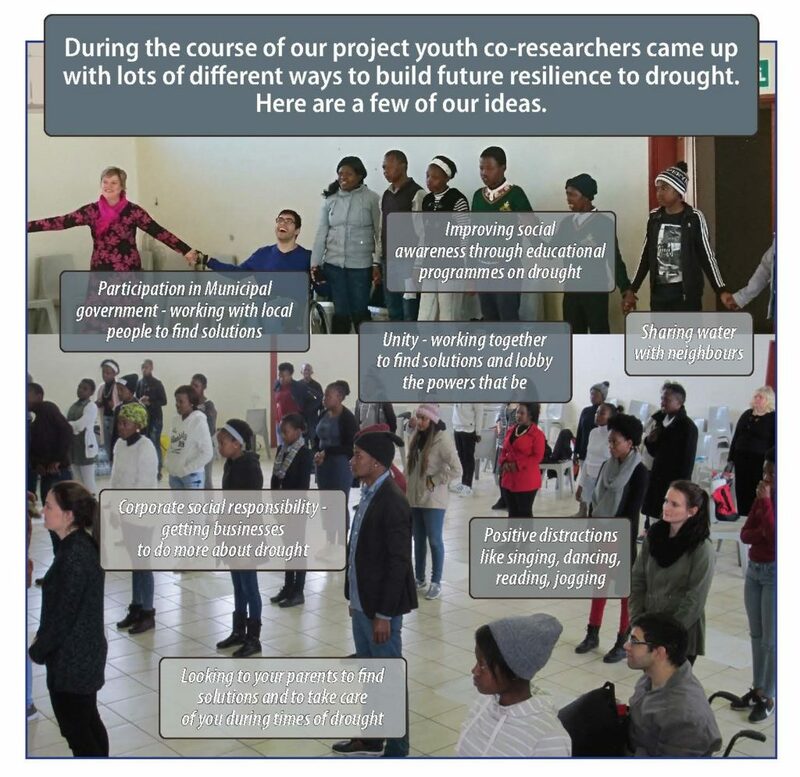 Our academic researchers supported university students to train the young people on how to conduct research with their elders, to gain further insight into the impacts of historical droughts. 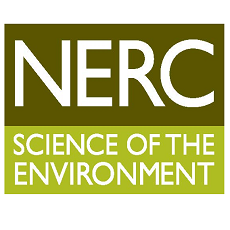 You can read more blogs about what the research team did, including reflections by young co-researchers themselves, at https://www.boingboing.org.uk/category/drought-project. We enlisted the help of Selogadi Mampane, a South African arts activist, to channel the co-researchers’ creativity into a film about the impacts of drought and changes which could be made to improve the situation for young people in Leandra. We also held a think tank event in Pretoria, where policy makers, academics, community partners and co-researchers with lived experience of drought co-created a policy briefing paper based on our findings. It’s early days yet. Our project has only just come to an end and we are still making sense of the process and findings. One thing that stood out as a key barrier to success was timing: we learnt the hard way to have a tolerance for the unknown and to plan for delays. This is especially vital when doing an interdisciplinary project with many members, including community co-researchers, in different countries. Another key learning was to never underestimate the value of local knowledge, particularly when working co-productively with local university researchers and community members. Throughout our project, we ensured that everyone’s contribution was recognised and valued equally, with our local co-researchers provided with training and payment for their input. All of our research was conducted in line with our official ethical approval in both South Africa and the UK. Lastly, to secure systemic impact, we tried hard to engage policymakers as early as possible. This was a challenge, due to their conflicting demands and the historical lack of collaboration between policy makers and academics in South Africa. The learning here is reflected in the IsiXhosa proverb, ‘Umzingisi akanashwa’, which means: ‘You must not let obstacles discourage you. If you persevere, you will win eventually.’ We are still holding out on this front. On the 27th of September, Boingboing will be holding a Resilience Forum on Co-producing research and policy on resilience to drought in South Africa at the University of Brighton. Head to the Boingboing project website to find out more or book your place. This research project was funded by a Global Challenges Research Fund grant from the Natural Environment Research Council, Economic and Social Research Council, and the Arts and Humanities Council.